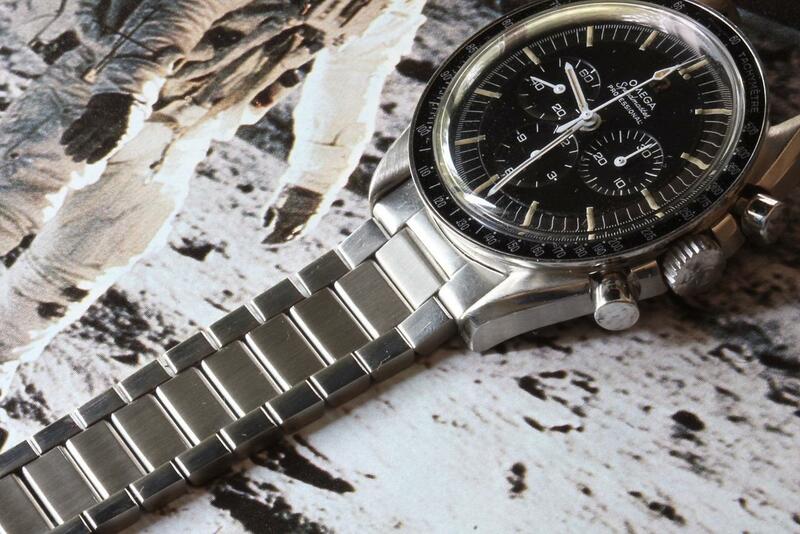 The best vintage Omega Speedmaster and Seamaster 300 flat-link 1960s bands now cost well into the thousands and the condition is often rough and stretched with links missing. Here is a cost-effective, very similar vintage mint condition flat-link generic band. 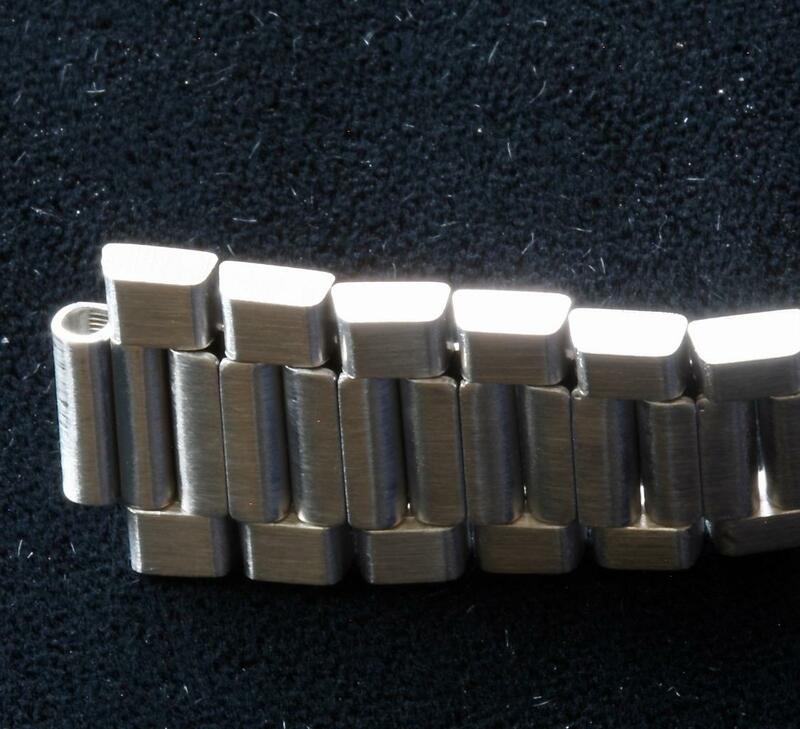 This one is a New Old Stock 1960s/70s bracelet with 10mm center end links that will take the original Omega end pieces or the inexpensive aftermarket Omega type ends. Flat-link bands are popular for a good reason: The links conform to your wrist, flexing just a bit and making these extremely comfortable to wear, while appearing sleek and stylish. The clean, simple look of one of these on a Speedmaster or Seamaster 300 just cannot be matched with modern bands. The band offered here in the center is flanked by an Omega 1039 band on the left and an Omega 7912 band on the right. I sold out of these desirable bracelets here at CT and on EBAY very quickly last year after finding some, but I’ve secured another small supply I am sure won’t last long either. The pictures here tell the story. 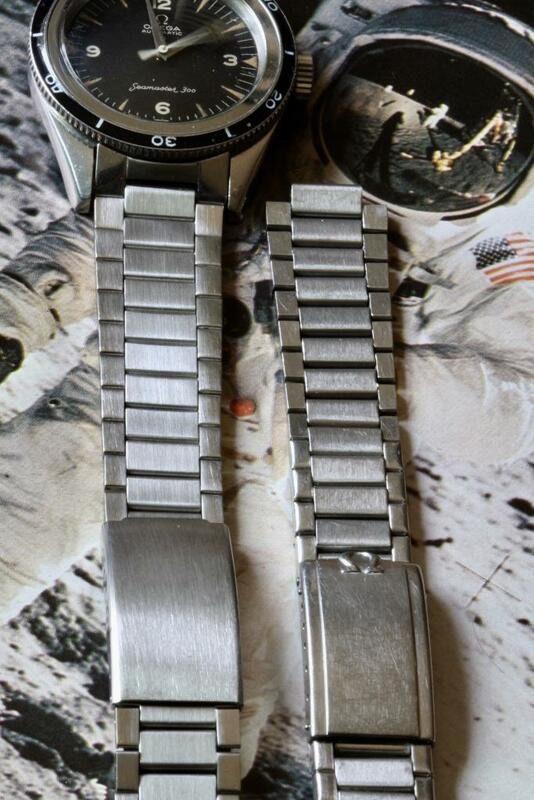 You can see from the photos that the generic band is nearly identical to both the Omega 7912 and 1039 bracelets shown alongside it. 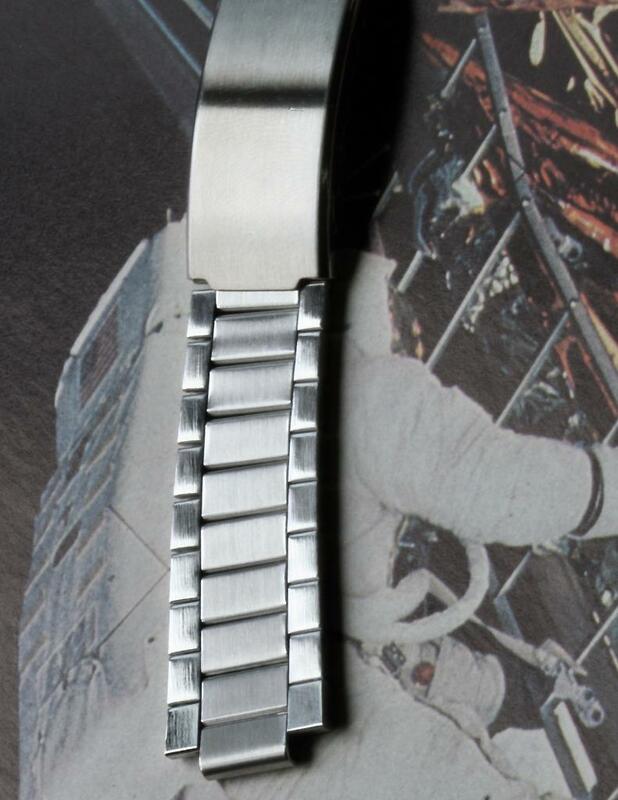 This generic band is also a close substitute for Omega 1035 and 1506 bracelets. 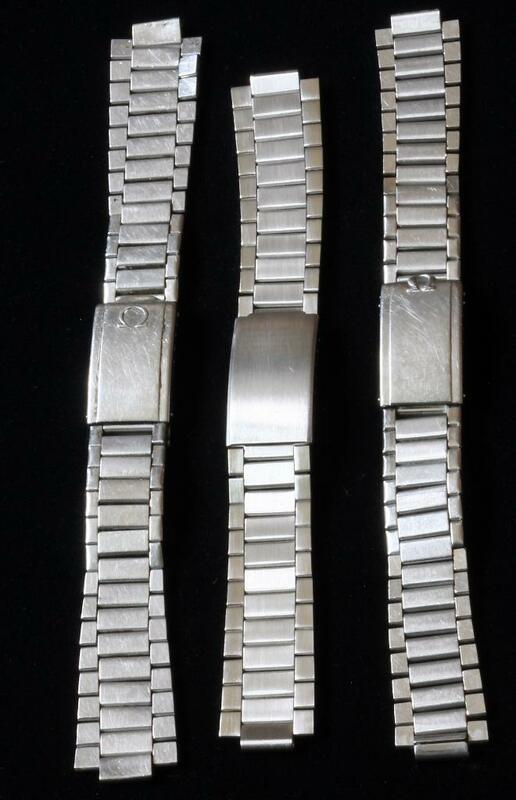 The taper of the unsigned band is very similar, as is the top finish, with a satin center row and polished accents on the edges like the original finish of the Omega flat-link bracelets. The clasp is 17.3mm wide and the links gradually flare out to 18.3mm wide at the end. The links are 2.8mm thick. 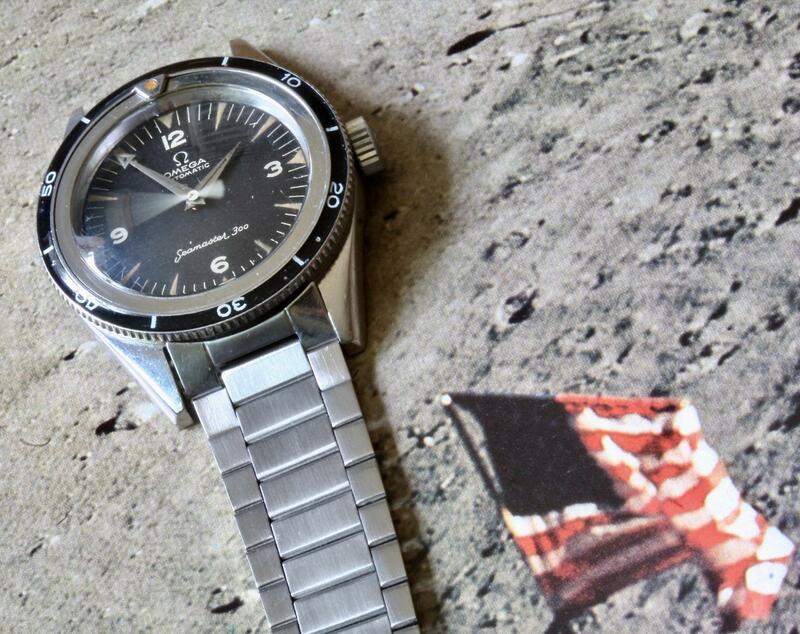 Build quality is a notch up from the Omega bands. The brick links of the generic are a bit heavier than the Omega band links. Band weighs 34 grams (vs 31 grams for the Omega bands). 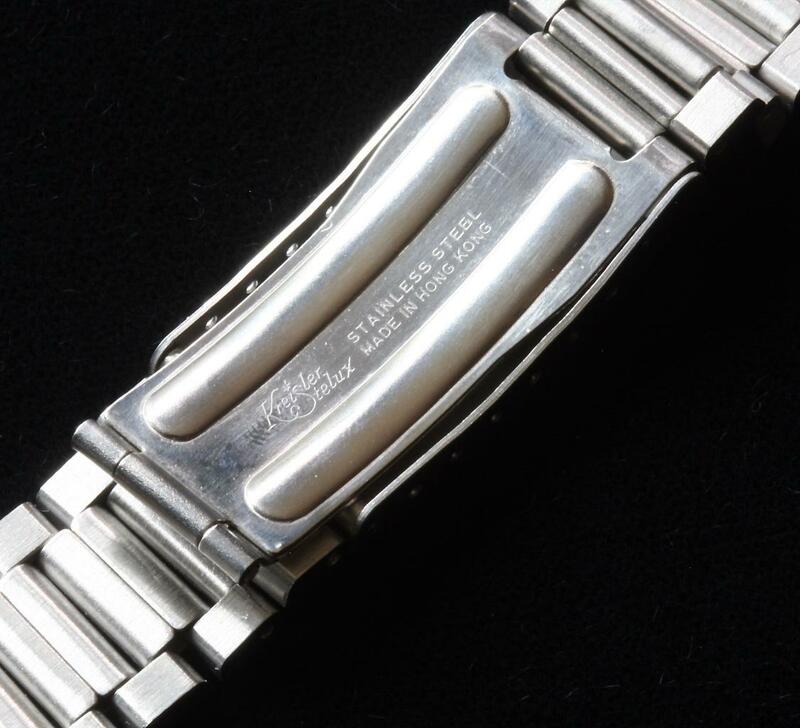 One feature I actually like better about this generic band is that the center end connectors have a spring bar tube built in to accept up to a 2mm thick spring bar to securely attach the bracelet to your watch. Original Omega flat-link bands don’t have that; the center connection pieces are just open links the spring bar slides through. The 10mm end connection piece will work with many Omega end pieces of the period that fit 19mm SM300s and 19mm or 20mm lug Speedmasters. 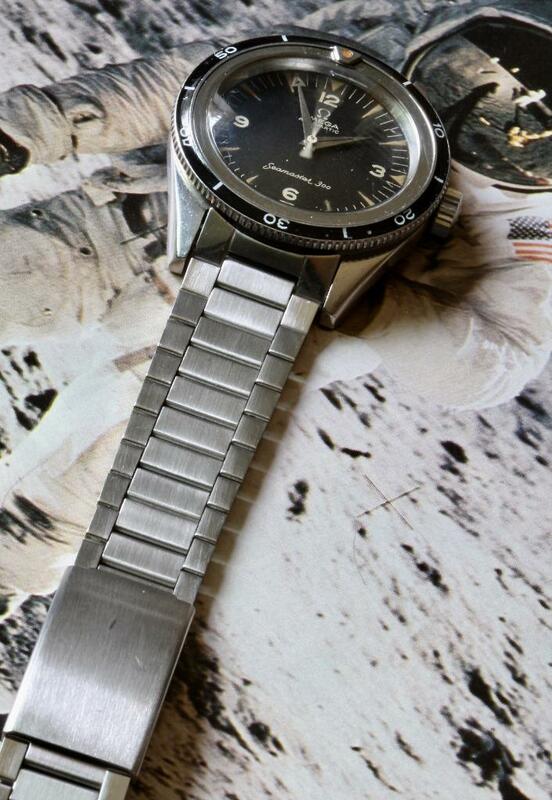 The flat-link bracelet for sale here is shown in the following pictures attached to the 1962 Seamaster 300 (ref. 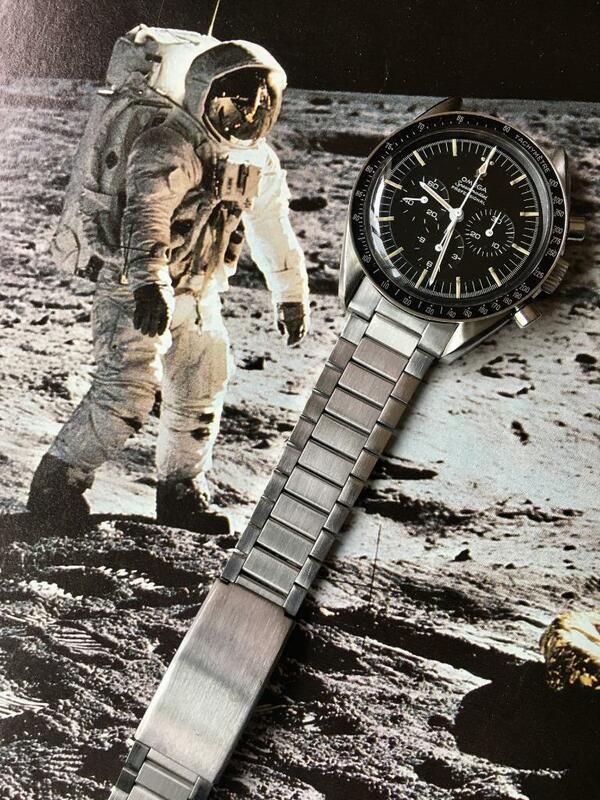 14755) with the original Omega #6 ends in 19mm and connected to a 1968 Speedmaster (ref. 145022-68ST) with original Omega #516 ends. This is also a great way to give later 20mm lugs Omega Speedmasters a vintage look, no matter what the year. 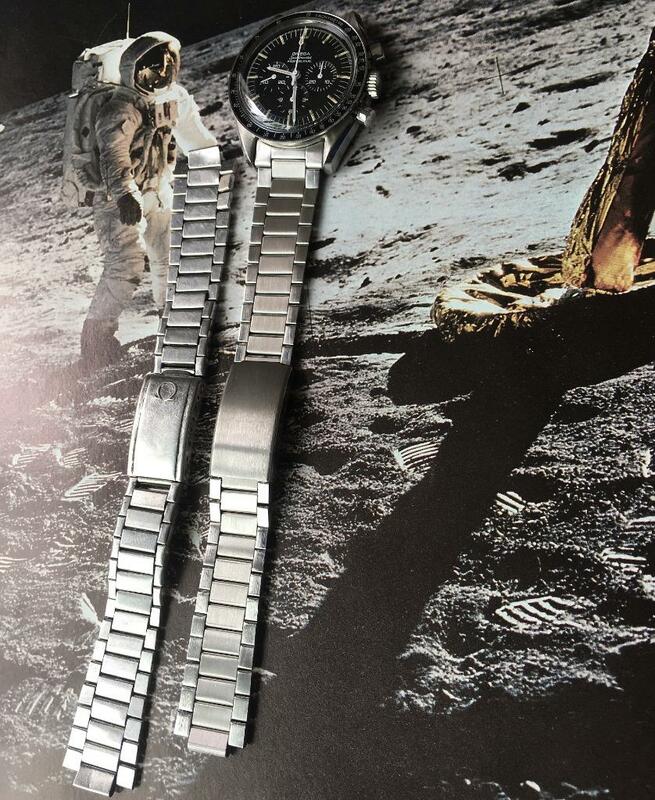 Shown here connected to Omega #516 end 20mm on 1968 Omega Speedmaster Professional with an original Omega 1039 band beside it. 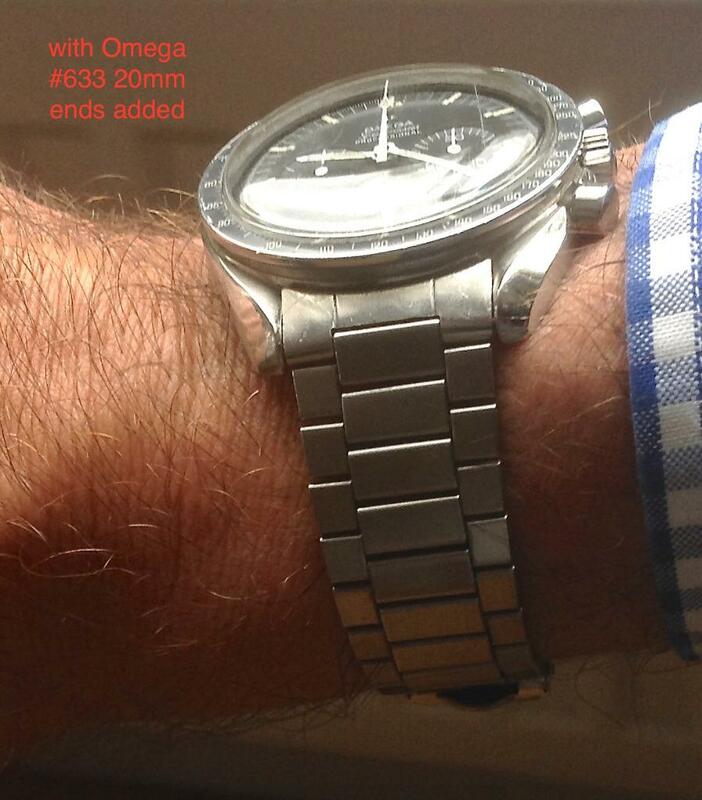 Shown here connected to Omega #6 end 19mm on 1962 Omega Seamaster 300 ref. 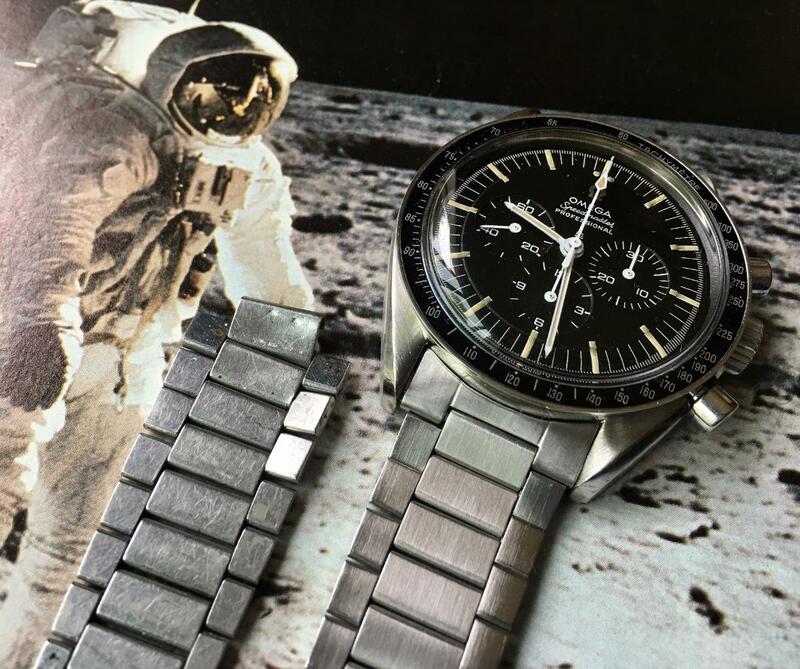 14755 with the original Omega 7912 band beside it. The 10mm opening end pieces you will need to connect this band to your special Omega are commonly available, including well-made, inexpensive 19mm and 20mm after-market end sets. If you own an early SM300 or Speedmaster, I can direct you to a source for 19mm Omega #6 style aftermarket ends that are an excellent fit (the original #6 ends now sell for $1500 or more). The 20mm Speedmaster #516 type ends are also available from the same source. 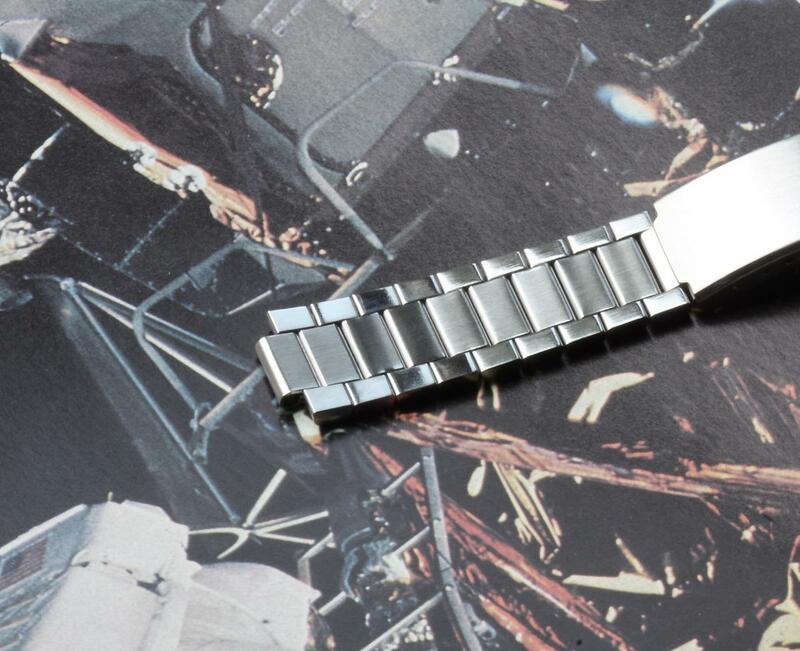 Some customers have also used generic flat-link bands they bought from me to connect to their 20mm lugs Speedmaster with the inexpensive later Omega #633 ends, but you need to lightly file the center connection pieces of the band because Omega #633 ends have center openings closer to 9.5mm. Here is an example shown from the last batch I sold here. This flat-link bracelet is a good length that will fit many wrist sizes. Fully extended the band measures 6 1/4 inches (16cm) and it sizes down to 5 3/8 inches (13.7cm) with the 7 incremental length adjustments in the clasp. The back of the clasp is signed “Kreisler Stelux Stainless Steel Made in Hong Kong.” These came stored in protective wrappers, so the condition is mint NOS. To make the band shorter, each side has a removable link with a easy, pop-out spring bar pin and then you can unfold additional links from the back and remove them as well. If you need a Short or Long version, they are priced below. U.S. buyers pay $7.99 for First Class shipping or $13.99 for Priority. International buyers pay $70 for Express shipping (arrives in 3-4 days) for any number of bands bought at the same time. Arrives in most countries within one week.